I promise I've been working on quilts but I definitely haven't had anything to show for it. It's been an incredibly busy time of year for me. I've been wrapping up my work at my old job and trying to juggle a new schedule with getting quilting done. It hasn't been easy. 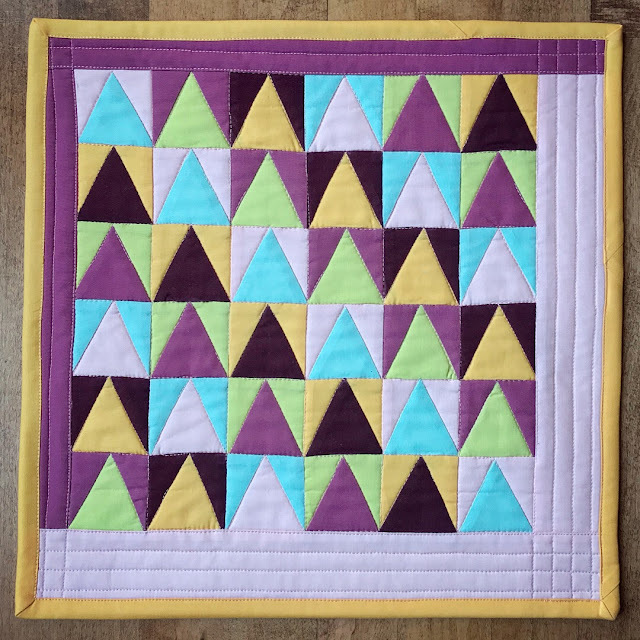 Fortunately, I found time to do this quarter's Curated Quilts mini challenge. The challenge was to use a specific color palette and triangles. I don't mind triangles, I don't use them often, but these little two inch triangles were too much fun. I haven't had a chance to name my mini but it kind of reminds me of triangles all sitting in a bookcase, hmm. The gals at Curated Quilts do an amazing job selecting color palettes and themes. I really enjoy participating in the challenges. This was so hard but I narrowed it down to twenty, just 20 of my favorite quilts from QuiltCon 2018. I took close to 60 pictures of quilts from the show and selecting just 20 of those for a blog post was really hard. It gave me a little, very little, taste of what it must feel like to be a judge. 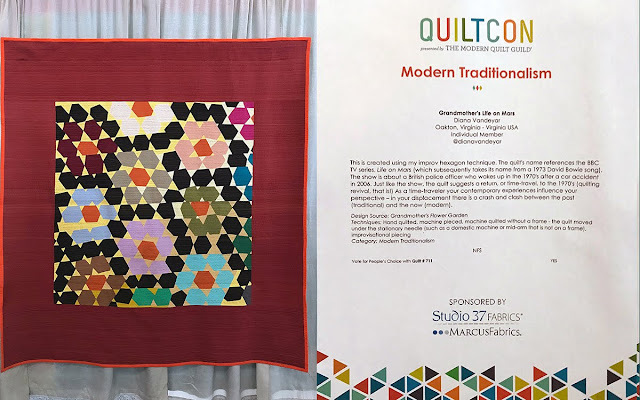 In the end I gravitated towards the quilts that I had met the maker because it added an extra dimension to the quilt that wasn't there before. Please forgive me, some of the photos are blurry. Enjoy the show!